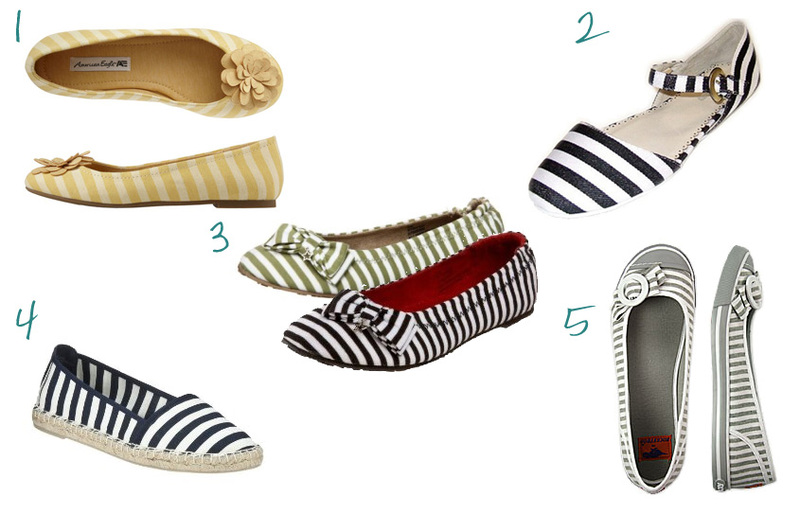 I keep stumbling on cute striped flats. I just decided that I should put all my favs in the same place. So, here, my friends, is a collection of striped flats at rock bottom prices. And this will be the last time I post on them, for at least a week. What do you guys think? Any of these catching your eye? I pretty much, definitely want all of those. #1 caught my eye! Now that I see they're from payless I love them even more! I just bought #1 and #5. Thanks! Love cheap, cute shoes. The Kmart ones are really different and CUTE!!! I also really like the ones from Payless. I LOVE LOVE LOVE the ones from k-mart!! Who knew?? Wow. thanks for posting these! What a great blog! I love the stripes--#1 and #5 are my favorites! Give me a cardigan and cute flats, and I'm a happy camper. i love flats, too! and stripes! two of my favorite things! I just bought #1 and have gotten many compliments already! OoOh these are awesome flats. I havent came across any that I like in a while. These are gorgeous. awesome blog you have. I just bought #4 from target, and they are suprisingly comfortable. and so stylish.